The below map highlights places that are the best to save for retirement. The study takes into account a paycheck friendliness score, a 401(k) plan performance score, a public pension plan performance score and a score for the number of financial advisors per capita. Scroll below to view the data and methodology for how the data was researched and compiled. To find the counties best prepared for retirement we looked at four factors: a paycheck friendliness score, a 401(k) plan performance score, a public pension plan performance score and a score for the number of financial advisors per capita. We reviewed this data for every county in the country. To determine which counties allow you to keep the most of your paycheck, we looked at paycheck size, purchasing power, unemployment and income growth. We first calculated the net semi-monthly paycheck for a single individual with two personal allowances making $50,000 per year. We then indexed the paycheck amount for each county to reflect the counties with the lowest withholding burden. Next, we created a purchasing power index for each county. This reflects the ratio of household income to cost of living. We also created an unemployment rate index that shows the counties with the lowest unemployment. To determine income growth, we calculated the annual growth in median income over five years for each county and indexed the results. Finally, we calculated a weighted average of the paycheck friendliness indices to yield an overall paycheck friendliness score. Once you've got your paycheck, to save for retirement some of your money will likely go into a savings plan such as a 401(k) or public pension. To determine which counties have the best 401(k) plans, we first calculated and indexed the ratio of employer contributions to total plan contributions. 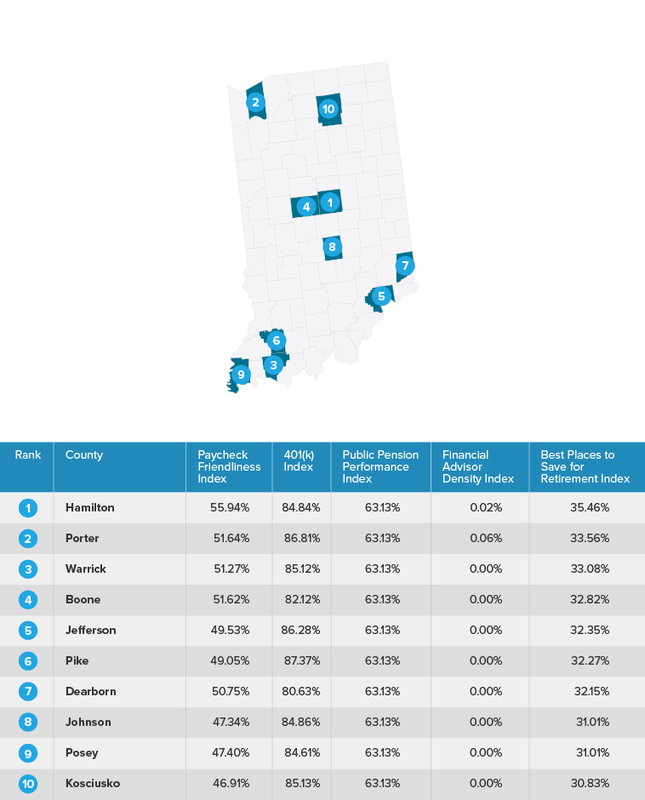 We then examined and indexed returns on total plan assets for each county as a measure of plan performance. Finally we indexed administrative fees as a percentage of total plan assets to determine county-level plan costs. Each factor was then used in equal weighting to determine an overall 401(k) score. To create the pension plan performance score, we used Census data on state and local public pensions for each state. We first calculated and indexed the ratio of government contributions to total plan contributions to determine the rate of government matching. Next we indexed each state's return score, measured as investment return over total plan assets. Finally, we determined and indexed each state's pension health index as the ratio of plan obligations to total plan assets. Each factor was then equally-weighted to determine each state's public pension performance score. The score for each state was then applied to each applicable county in the study. Finally each of the four factors described above were indexed to determine the best places to prepare for retirement. Learn more about financial advisors in your area below through our detailed advisor profiles organized by location. That's just one of the ways that we make it easier to find and research financial advisors. You can also find nearby financial advisors through our matching tool, which does the work for you by pairing you with advisors based on your situation and preferences. Learn more about financial advisor firms in your area below through our detailed advisor profiles organized by location. That's just one of the ways that we make it easier to find and research financial advisor firms. You can also find nearby financial advisors through our matching tool, which does the work for you by pairing you with advisors based on your situation and preferences.